Arzberg “Colon Blue” Soup Bowl with Double Handles, Saucer and Salad Plate. The “Colon Blue” range was available between 1978 and 1990 and is simple and elegant. Arzberg quality German porcelain is renowned for its striking shapes and practical functionality. This cup and saucer with bread and butter plate is a testament to this styling. The classic among beautiful everyday porcelain. 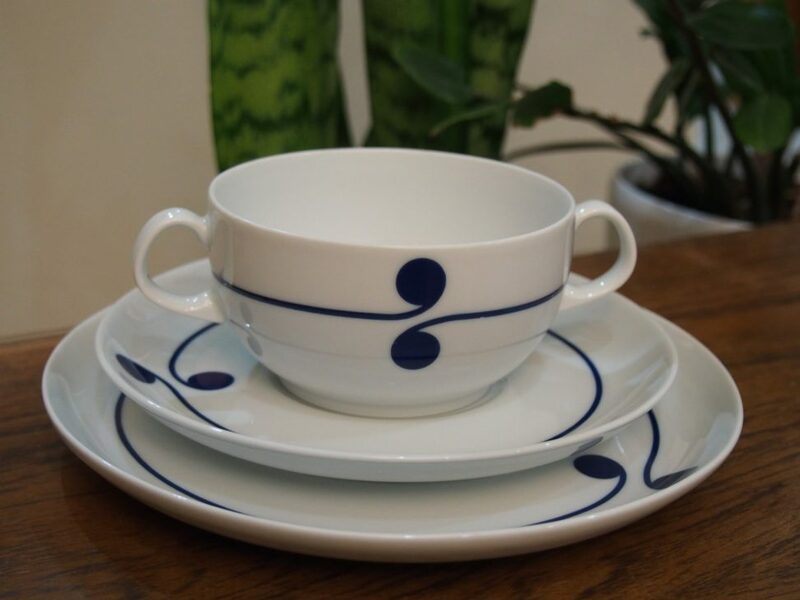 In 1931 Arzberg launched a set that was to revolutionise the world of porcelain. Form 1382 by Dr Hermann Gretsch: It was the rejection of impractical, ornate sets and a ‘thumbs-up’ to functional, aesthetic everyday porcelain. “We can no longer afford to launch things that the consumer quickly tires of because they are impractical, outdated and obsolete”. The Form 1382 design has not been changed since and, to this day, it has not lost any of its allure. The collection belongs to the classics of modern industrial design and is one of the very few porcelain forms to feature in the Museum of Modern Art in New York.